Coastal erosion is a natural coastal process in which sediment outflow exceeds sediment inflow at a particular location. These sediments are typically transported from one location to another by wind, waves, currents, tides, wind-driven water, waterborne ice, runoff of surface waters, or groundwater seepage. Depending on the location and processes in place, coastal erosion can take place very slowly, whereby the shoreline shifts only inches to a foot per year; or more rapidly, whereby changes can exceed ten feet per year. Intense storms and human interference can result in avulsive events where large portions of a beach or dune are washed away by strong currents and large waves. 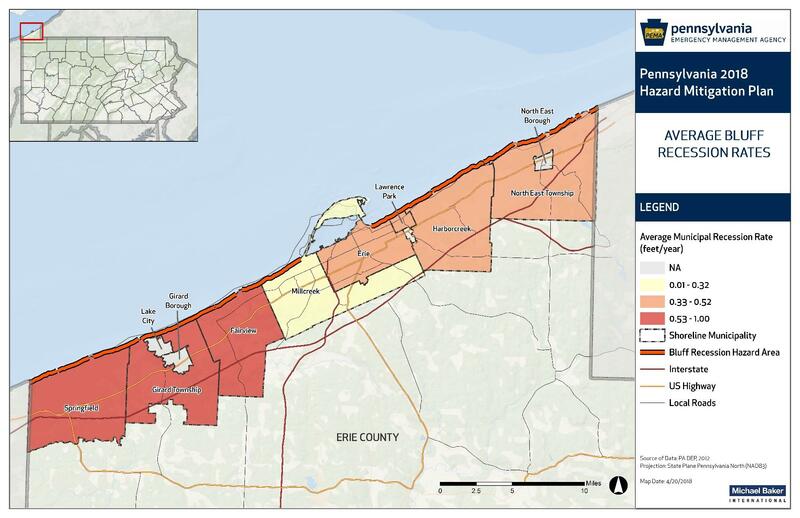 With the exception of portions of Erie County, coastal erosion is not a hazard for communities in Pennsylvania. (FEMA, 1997). PA DEP’s Coastal Resources Management Program monitors coastal erosion along the Lake Erie shoreline with approximately 130 established control points. Average recession rates are measured by municipality and range from approximately 0.3 feet per year to nearly one foot per year in the easternmost municipality of Springfield. The long-term average recession for the Pennsylvania Lake Erie Coastal Zone is 0.75 feet per year; however, losses of up to twenty feet in a single year have been observed (Hapke et al., 2009 and Pennsylvania Sea Grant, 2002). Future shoreline erosion and bluff recession can be considered highly likely. Coastal erosion will also be influenced by future climate-related changes projected for Pennsylvania such as warmer temperatures, increases in the frequency and severity of storm events, and increases in precipitation. Average Bluff Recession Rates along the Pennsylvania Lake Erie Shoreline (PA DEP, 2012). 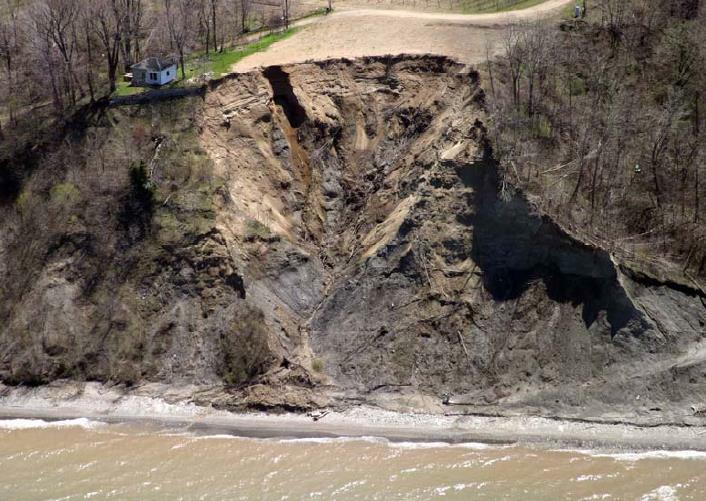 Photograph of Large Avulsion Event along the Lake Erie, PA Shoreline (USGS, 2009 and the PA DEP Coastal Resource Management Program).